Not Muslim Anymore: Why Muslim Apostates Should be Executed! Why Muslim Apostates Should be Executed! Many Muslims say that people who leave Islam shouldn't be killed, but many say they should. This Islam Q and A (Question and Answer) site explains the "good" reasons why. The punishment for the apostate is execution. Why such harshness? Let's look at the reasons they state. Is thing kind like "until death do us part"? They don't enforce that! People change. That doesn't mean that they went into it as a fad or anything. I was Muslim for about 13 years. I lived as a Muslim, raised my kids as a Muslim, and really never thought I wouldn't be one. But what I believed and felt was important changed. Does that mean I went into Islam just to "follow the crowd"? 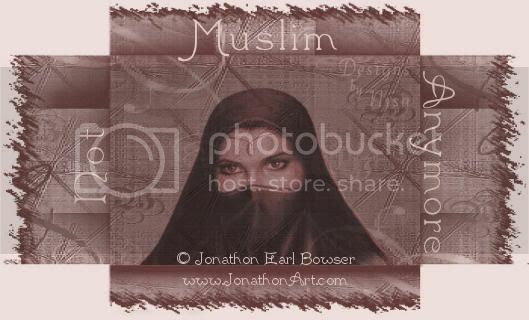 If I was following the crowd, I never would have become Muslim! 2. The one who announces his Islam has joined the jamaa’ah (main body) of the Muslims ... Apostasy from Islam means forsaking the jamaa’ah and its divine order, and has a harmful effect on it. Execution is the greatest deterrent that will prevent people from committing such a crime. Is freedom of religion a crime? When I became Muslim, they didn't have me sign an oath in blood! Why is one person or some people leaving Islam harm it? Is that the only way you can keep people in, by force? 3. Those Muslims who are weak in faith and others who are against Islam may think that the apostate has only left Islam because of what he has found out about its real nature, because if it were the truth then he would never have turned away from it.In this case executing the apostate is obligatory, in order to protect the true religion from the defamation of the liars and to protect the faith of its adherents and remove obstacles from the path of those who are entering the faith. Oh, so they don't want people to see others leave Islam and think that they can leave it too. Or think that maybe things are perfect in Islam. Why don't you let people think for themselves and come to their own conclusions, instead of killing people who leave so others won't leave it? 4. We also say that the death penalty exists in the modern laws of man to protect the system from disorder in some situation and to protect society against certain crimes which may cause its disintegration, such as drugs etc. If execution can serve as a deterrent to protect man-made systems, then it is more appropriate that the true religion of Allaah, which Falsehood cannot come to it from before it or behind it [cf. Fussilat 41:42], and which is all goodness, happiness and tranquility in this world and in the Hereafter should punish those who commit acts of aggression against it and seek to extinguish its light and defame its image, and who fabricate lies against it to justify their apostasy and deviation. So all apostates lie about the religion? How does leaving Islam and stating what you think about it relate to the death penalty in modern laws? That is for murderers, not people who want to change their religion! This is the most ridiculous thing I have ever read! You want to justify killing people who left Islam. Is that the only way you can keep people in your religion? Thank DOYC that I left it!!! I don't know which logic is more tortured: the claim that Islam does not call for the death of apostates or the attempts to rationalize the punishment. If apostasy is not considered a capital offense under the faith why are so many Muslims lead to believe that it is? What is it about Islam that makes it so easy for millions of its adherents to misunderstand it? Shouldn't people consider a religion successful if it leads its believers to a better understanding of its teachings rather than a worse one? And if death for apostasy is proper under Islam then there can be no other conclusion than that the god of Islam is possibly THE most insane gods to ever curse our world - and that is really saying something. Thanks for commenting on my blog! Believe it or not, I actually have your blog bookmarked! So I was pleasantly surprised when you left a comment! :) I appreciate your sincerity. I am being strong Anisah. He thinks he's in control, perhaps he is for now, but not for long. I have more faith in God than I do in a man. He can't fool me anymore. I'm not afraid of being a single mom with 5 kids. His time of glory will soon be over. Payback is a b*tch, as they say! I have been wanting to comment on your blog for quite some time now but the kids are driving me insane, it's the weekend! LOL! So, do keep posting, I love to hear your views on Islam. I just wanted to share with you a website that I frequently visit. Just some food for thought, perhaps? Sister, why did you leave Islam if you truly believed in it? Molly, have you read my About Me (Long Version) linked on the right side (or Here)? I'm a single mother living in a small town in the Midwest. This blog and it's opinions are © A. under United States copyright laws. Use is not permitted without written permission. Link to me, don't copy and paste my post to your own page.